Consider all our horses and the millions of hay bales we toss to them every year. We’re now collecting it in Mancos. 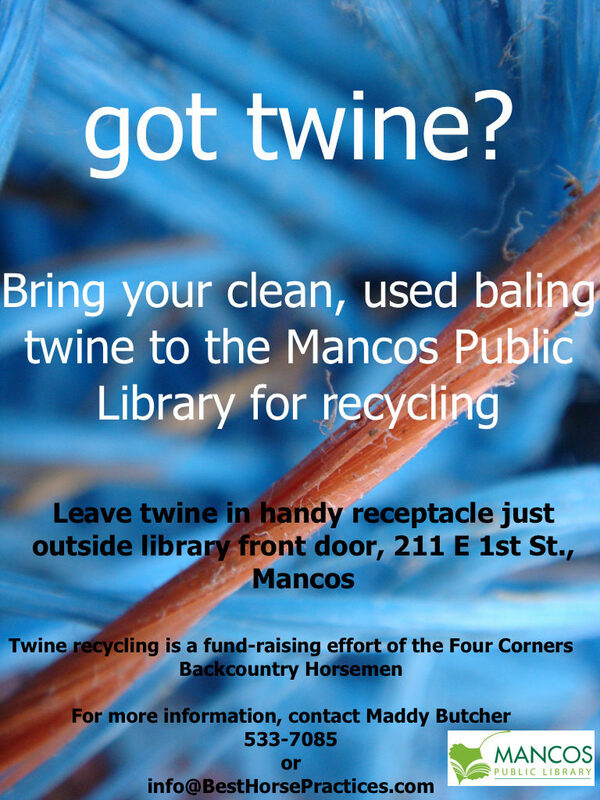 Bring clean, used twine to Mancos Public Library. Read the flyer here. Until recently, there were no good answers to the twine waste problem. But the Four Corners Backcountry Horsemen club is starting to collect the twine for recycling. As soon as it has enough, the club will ship it off and may earn as much as five thousand dollars for its efforts. Christopher Smyth is organizing the recycling effort in the Durango, Colorado area. He first heard of it from Emma Van Dyck, who developed it as a 4H project a few years ago. Read more about that here and watch video. As far as these folks know, just one American plant recycles twine: the I 90 Processing plant in Albert Lea, Minnesota. 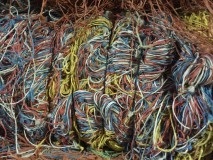 The company makes new twine from the used product. Currently, only a handful of communities are taking advantage of the program. Certainly, there are challenges. For starters, you need A LOT of twine to make shipment to Minnesota worthwhile. Smyth says the club is aiming to collect 40,000-45,000 pounds of twine over a few years. Next, you need a place to store it. Valley Feed and Ranch Supplies in Bayfield, Colorado, has stepped in to provide space. Smyth said the club is now looking for a container to place on site in Bayfield. Additional plans will be made to have collections elsewhere in southwestern Colorado. 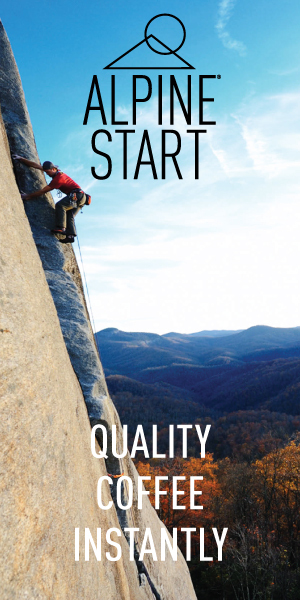 We think it’s a great project. Kudos! Sound like a good idea, but not to user friendly, do to the large quantity of twine require. Other than being the Maine way, every thing being tided with bailing twine, have you consider different craft groups. The wife and daughter used to make a lot of fancy work to just hang stuff. Getting people to make hanging plant holders, and stuff during the winter months, while feeding the stove, drinking coffee and waiting for the snow to melt This could be a cash crop out of smoothing that is basically a through away item. Here in Maine, hand crafted, and locally made, sells!